USS Helena (CA-75) anchored in Apra Harbor, Guam in December 1952. 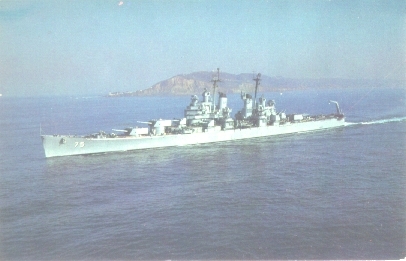 USS Helena (CA-75) served in the Pacific Fleet during the Korean War. She saw action off the coast of Pohang and Changsa-Gong in SEP 1950. Fitted to carry and launch Regulus cruise missiles and underwent limited flagship conversion. Embarked COMFIRSTFLT, home ported at North Island (San Diego), CA.